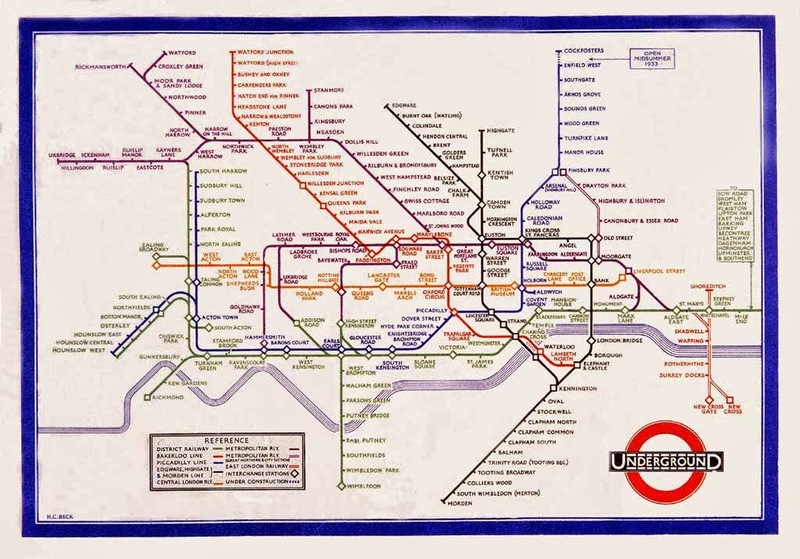 My first encounter with Tubism was at a house party with a large poster of the London Underground hanging in the living room. 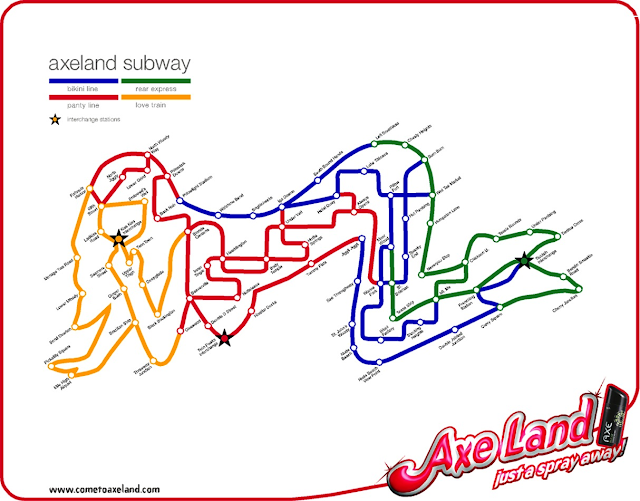 Looking closer, I found that the Tube stations had names like Semantics, Leonardo Da Vinci and Fordism. 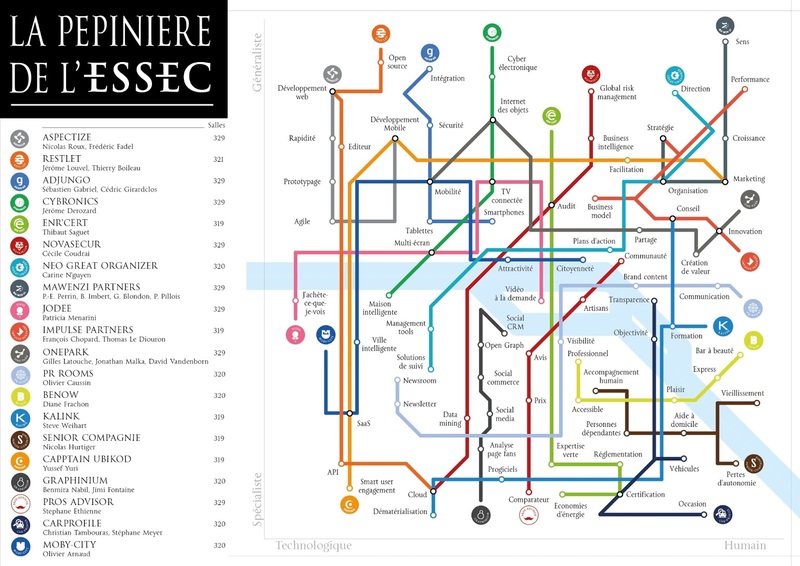 The map was full of intriguing references that served as perfect conversation-starters for the many guests who gathered around it that night. The poster's designer, Sean O'Mara, encouraged me to try doing my own Tubist posters. It wasn't easy but I began to learn by experimenting with themes like scientific inventions, the Arab-Israeli conflict, LGBT celebrities, songs about Paris, social sciences, poetry and religious rites. Some people asked me to do Tubist portraits based on information from their friends and Facebook profiles. A Tubist portrait by Pierre Nadilon. Tubism makes it fun to wander through topics and spot connections. At the same time, it has been criticized for a lack of originality bordering on copyright infringement. 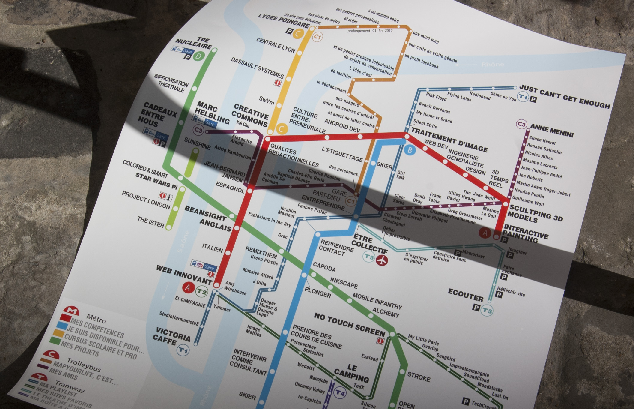 I agree that designers who created the original subway maps deserve credit. Tubist imitation is based on respect for the enduring quality of their work. It is also useful for adding an element of surprise: subtly altering well-known images helps bring playful unexpectedness into everyday settings. 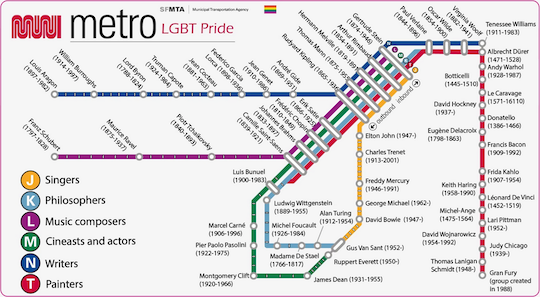 "LGBT Pride" version of the San Francisco Muni map, by Pierre Nadilon. It isn't clear whether Tubism is art, design or something else. Artistically, it draws upon pastiche and trompe-l'oeil. Based on Marcel Duchamp's view of art as the interplay between intent, realization and perception, one might conclude that Tubism is artistic when intended and perceived that way. 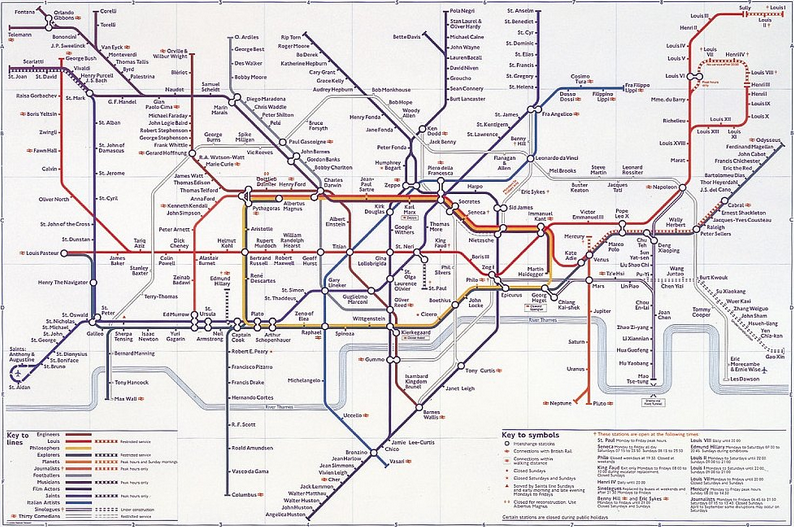 Simon Patterson's adaptation of the London Underground map, for example, is now part of the Tate collection. According to Nelson Goodman, art performs symbolic functions in different contexts, creating aesthetic experiences from specific perspectives. He finds the question "What is art?" less important than "When is art?" Tubists may create aesthetic experiences, but presenting information in unexpected ways is usually a higher priority. In this respect, Tubism is a form of communication design. It is even used for résumés and advertisements, but it is not always so pragmatic. Despite Tubism's questionable originality and identity, it is a fresh newcomer in the world of street expression. Tubist posters can be attached quickly to walls any time without attracting much attention. In public space, they are akin to understated graffiti or psychogeographic urban interventions. As digital tools for design and printing become more accessible, Tubism could flourish in cities around the world. 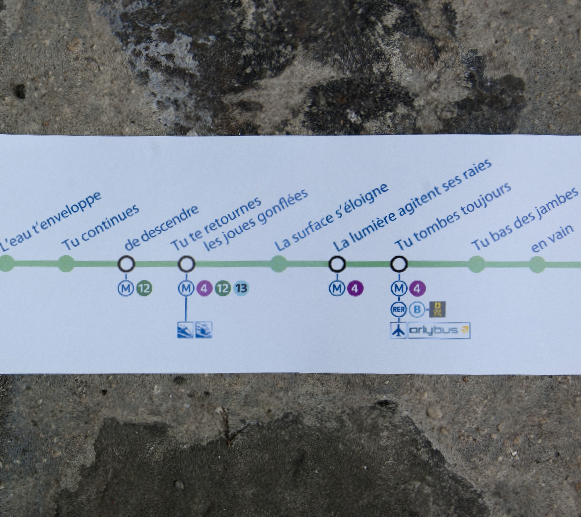 "Le Plongeon" version of Line 6 on the Paris Metro, by Pierre Nadilon. Pierre Nadilon is a digital, conceptual and urban artist based in Paris. He is currently working on a comic with psychological ingredients. Pierre is always willing to share what he knows with people he doesn't know. I also enjoyed the thinking behind your work. The line between art and other pursuits does seem less obvious than I had imagined, context and perspective are so important.